Diet Sodas? 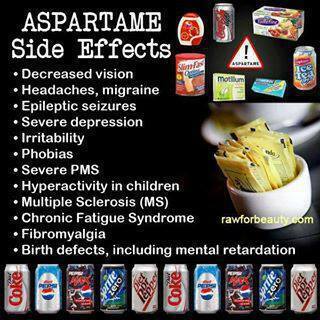 Aspartame! YUCK! - Training Day Fitness, Inc. Most of you probably already know this, but… most artificial sweeteners cause autoimmune response effects which can increase inflammation around the body and therefor, worsen Fibro symptoms. Easily the #1 thing you must cut from your diet completely – if you haven’t already – is artificial sweeteners. DO NOT allow the product into your home if it contains those things. Be especially alert when the packaging says “diet”, “light”, “0 calories” or “no sugar added” – as these products are often loaded with these and other chemicals.